The bagua map is a specific tool used in Black Hat Sect (BHS) feng shui practice. Taken from a more complex use of the traditional feng shui bagua, this shortcut map for how to use the bagua in your home is often referred to as a cookie cutter type of feng shui since it is used the same way for every house. Unlike traditional feng shui where compass readings for the sitting and facing directions govern the use of the bagua, Black Hat ignores the magnetic compass directions of the home. The bagua map, unlike the octagon bagua, is a square comprised of nine equally-sized, smaller squares, is placed directly over the house layout. BHS feng shui calls this a symbolic bagua map and it's fashioned after the traditional feng shui lo shu. Print the bagua map above using Adobe Reader. Then procure or draw the layout of your home. This drawing should indicate your front door. Other exterior doors should also be added. Be sure to scale-to-size so that each room in your home is accurately represented. 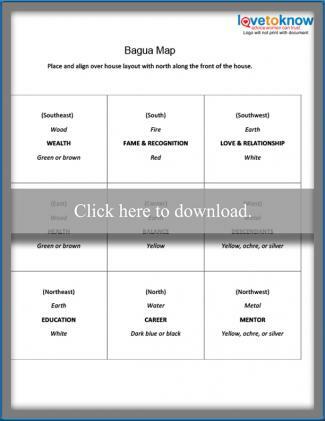 Click to download and print the bagua map. Superimpose the bagua map over your layout. In feng shui, the South Sector of the bagua map is always placed at the top of a layout. This means that the bottom (North Sector) of the bagua map will fall over the front side of your home layout. While the north direction defines the front side of your home, your front door may fall in the N, NE or NW sector. Example overlay of the map and blueprint. You can now use the map to help strengthen various areas of your life, such as career, money, relationships and health according to BHS feng shui. 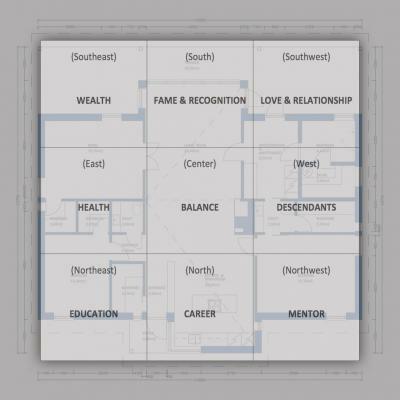 Begin by familiarizing yourself with each sector of the bagua and how it relates to the room(s) of your home. The eight sectors (palaces) of the bagua correlate to the eight compass directions. These are also known as the eight aspirations. Just remember that BHS feng shui doesn't follow the actual magnetic directions of your home the same way classical feng shui does. The ninth sector is located in the center of the map. If you are experiencing any negative effects in your life from one of these eight sectors, you can use feng shui principles and remedies to transform the inauspicious aspects and attract auspicious chi energy. The Chinese believe that south is the most auspicious direction, so this direction of the bagua is located at the top and placed over your home layout in this manner. The luck factor activates recognition and can stimulate career promotions and growth. Place awards, degrees and other symbols of your achievements in this sector of your home. Add floor and table lamps to further activate the fire element. The southwest can be activated to help you in all types of relationships. If you are seeking love and romance, add earth elements to activate this sector. Use a natural crystal, lamp or clay pottery. There are several feng shui symbols you can use, such as the double happiness emblem, rose quartz, amethyst crystal or a ceramic pair of Mandarin ducks. Reinforce relationships with photos of loved ones, especially a wedding photo for married couples. The west oversees your descendants' luck. If your children have challenges or difficulties in their lives, you can assist them by activating this sector. You can activate this sector by using metal photo frames for pictures of your children. Use a grouping of nine for the ultimate feng shui luck factor. Nine is the number of longevity and success. This is the sector for mentor luck. The northwest sector can assist you in finding someone to help you learn a new skill or craft or impart knowledge you seek. If you are in need of an influential person's assistance or a patron, then select a metal object or wall art for this sector of your home. A six-rod wind chime is an excellent choice. You can use other symbols of victory and success. A well-known expert in your field can be represented with a related book or article placed in this sector. The north oversees careers. If you're having difficulty advancing your career or need an extra boost for a project, activate this sector. One of the fastest ways to activate your career luck is to place a water fountain in this sector. Make sure the water flows into the room and not out of it. An aquarium is another great tool for activating the water element. For optimum success use the lucky number of fish for the tank - eight red fish and one black fish. The black fish will deflect negative chi. Keep the aquarium clean and replace any dead fish immediately. The northeast governs education. While academic education falls under this sector, other forms of education are also included, such as on-the-job training or independent studies. If you need a better education or if you are studying for an exam or licensing, then activate this sector. Activate this sector with a crystal or bright light. Use symbols of education, such as a globe, textbooks and other objects. If possible, turn this sector into a study area with a desk, chair, and task light. This sector is often neglected because many people place emphasis on career, love, and money. If you don't have good health, none of the other things will matter. This sector also rules growth and of course, longevity. You can activate this sector with lush plants, such as a jade plant and others with round or oval leaves. These shapes symbolize coins. Avoid plants with pointed leaves since these create poison arrows. A lucky bamboo plant is an excellent symbol of health. Other objects include an iconic peach, wood furniture, water fountain, or aquarium. This sector controls your wealth or prosperity luck. Activate this sector to stimulate greater income and overall family. Like the east sector, the southeast element is wood and can be activated by the same methods. You can also use symbols of wealth, such as coins, gold ingots, and wealth ships or jars. This sector is the center of balance or yin yang. The center of your home radiates to all other sectors and is vital to auspicious chi in a home. Like the northeast and southwest sectors, you an use crystals or pottery to activate the earth element. You can also use symbols of balance, such as a framed yin yang drawing or other depiction of this ancient symbol of balance. These are just a few of the many symbols and objects you can use to activate each sector. 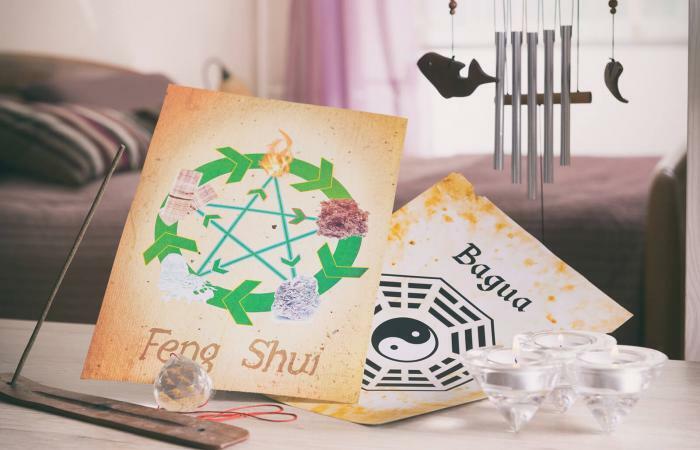 The bagua map used in Black Hat Sect feng shui can aid you in attracting the benefit of auspicious chi energy for these areas of your life.